I do a lot of keyboard firmware development, and I still do all of it with my Epsilon which is getting to be outdated. I need a more advanced board that can take advantage of new features and can be used to carry on with my Easy AVR development. I feel a new project coming on. What comes after Epsilon? Zeta. It's very important to me to have the keyboard centered in front of the monitor, with the mouse as close by as possible. Minimalist boards are great for that, but I also like having all the keys I'm familiar with in the ANSI places I expect. A good old TKL works, with 75% being a viable option. I've also become very interested in visual feedback on the keyboard, so I needed something a little extra to play with. Most keyboards only have two or three indicator LEDs (Caps/Scroll/Num). This one has eight. It also has four backlighting zones, which isn't exactly cutting edge, but I'm not very interested in flashy gizmos these days. Each white key is an indicator light and each color represents a backlight zone. Indicators can be programmed to be backlights, which will activate them as part of the green mod/nav zone. There is a total of twelve discrete lighting outputs, which should give me lots of room to experiment. I can have one for caps lock, scroll lock, win lock, fn lock, and still have four more left for other interesting things, plus backlights. This will be a good development platform. As soon as I struck on a design that tickled my fancy, I found myself in KiCAD drawing lines again. That's when things get real. This keyboard needs to be my daily driver. A proper PCB is a must. It's a very expensive way to get a design made just for yourself, but that's the price I pay for durability and full LED support. As with my previous projects, I'm basing the design around an ATmega32U4. It is well supported by the community and my firmware likes it very much. It has plenty of room for my current code base to grow, unlike smaller microcontrollers like the ATmega32U2, which is very short on RAM. I think that ARM processors are going to be the norm very soon, and I think this is the right direction to move. The AVR architecture is too limited to keep innovating. However, I have lots I can still do with my trusty ATmega32U4. Plus, I have a pile of them in my basement to use. To keep I/O lines open for the LEDs, I used a 4-to-16 line decoder for the column select. It's a nice little chip but it's hard to solder such small leads. To drive the backlights I'm using standard NPN transistors as a common collector amplifier. This is a pretty good design because it doesn't leech any power from the microcontroller. You just have to make sure to limit your LED current so that you don't overdraw from the USB. The matrix is a fairly uninteresting 6x16 grid. Organizing and naming the switches and LEDs is always my least favorite part of the process. I usually try to layout the schematic similar to how I plan to layout the PCB, because it gives a little bit of insight as to where the traces might get busy. I decided to switch it up a little bit and I made the left and right hand different backlight zones. One reason was to even out the loading of my drivers, but also I figured it might lead to some interesting backlight usages in the future. I haven't really decided how to use it yet. 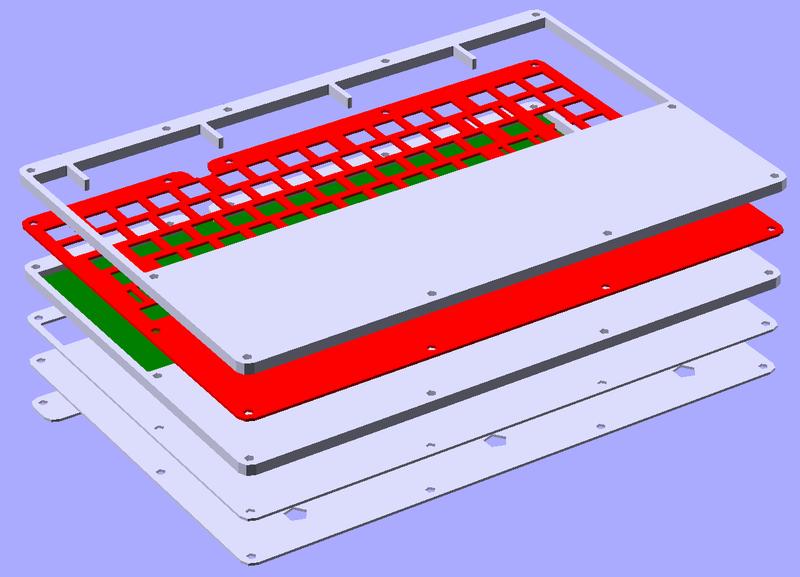 At this point I intended to take a break but I just couldn't help myself and dove into the PCB layout. It's a tedious task but I rather enjoy it. It's relaxing to trace those little lines around. It's exactly like putting a puzzle together. This board had quite a bit to fit compared to my other projects, however I decided to keep it simple and only support one specific configuration, so there was plenty of room. The only configuration option, as a matter of fact, is to install a MX Lock switch on the Caps Lock. It has an offset LED that requires an extra hole. Compared to my past projects, the switch footprints are less complex. I'm going for a refined look. 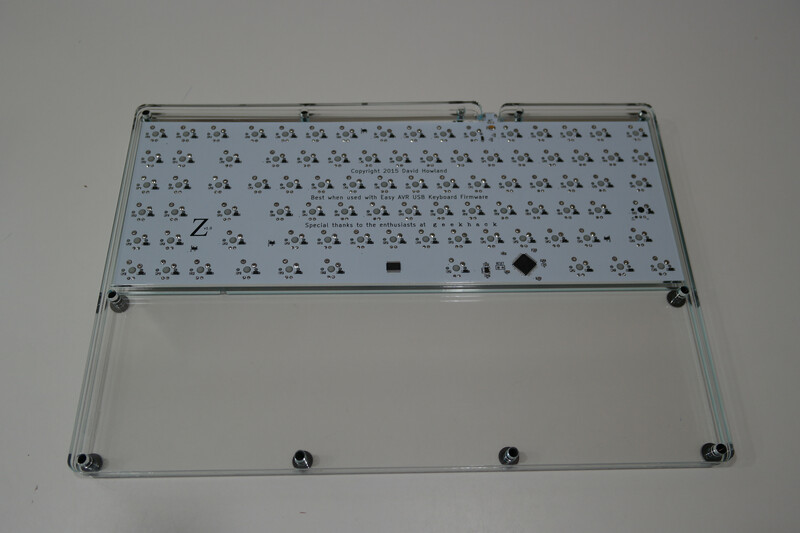 Though the PCB supports PCB-mount switches, it requires plate mount stabilizers. I plan to use costar stabs, anyway. I had PCBwing do the fabrication. 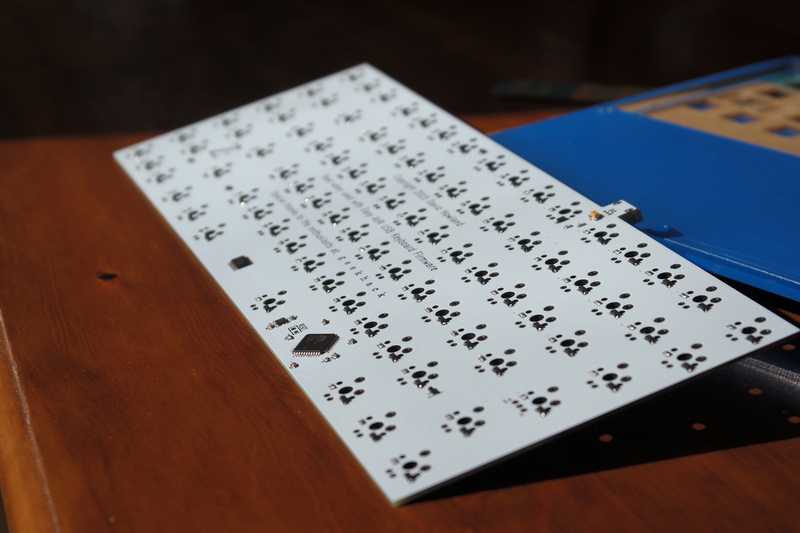 They are a relatively cheap PCB fab, but they do a decent job. They are sticklers for design rules, though. You can't really get away with any broken holes or pads near the edges. I was feeling good about this design, so I splurged on the white solder mask. Electronics and firmware are no trouble for me, but I really have no experience with designing for the physical realm. Honestly, if fabrication was easier I would take the time to learn, but it's just not practical for my situation. A single finished part requiring milling, tapping, and anodization costs too much without any volume discount. And that's assuming you find someone to work a small order. None the less, I still need to house my keyboard in something. Given these constraints, I've got to go with an acrylic sandwich design. By selecting from the many thicknesses available, I can make it only as thick as necessary to hold the assembly. I can also use a thin plastic plate for comfort. 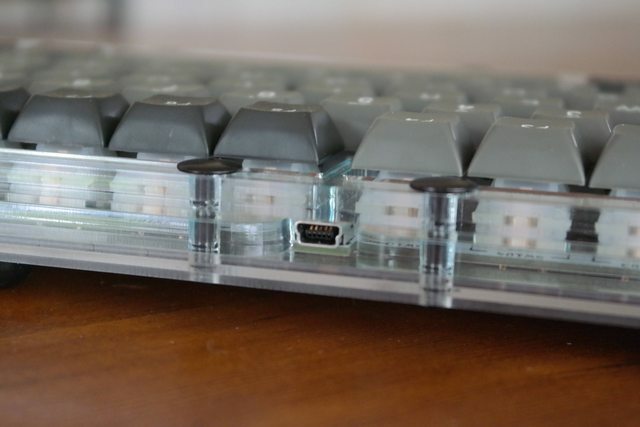 It's a lot cheaper to get cut than metal, and the clear acrylic will show off the DIY insides. Nice! I've always loved the idea of a built-in wrist rest. I'm not sure if it's the look or the comfort aspect that appeals to me so, but I'm going for it in this design. As soon as I had the layout finalized, I drew it in LibreCAD. I made the sides as thin as I though they could go without being a breaking risk, then went crazy with the height. I decided that 4 inches of extra material was probably a good amount for my hands. Too long and it will have table-fitting problems, and too short will put the corner right on my palms. You may notice two things: no cutouts for switch opening and no support for Cherry stabs. Like I said before, I'm really keeping simple with this board. I've never once swapped stems or springs on any of my other custom boards, so I don't feel those cutouts are necessary. 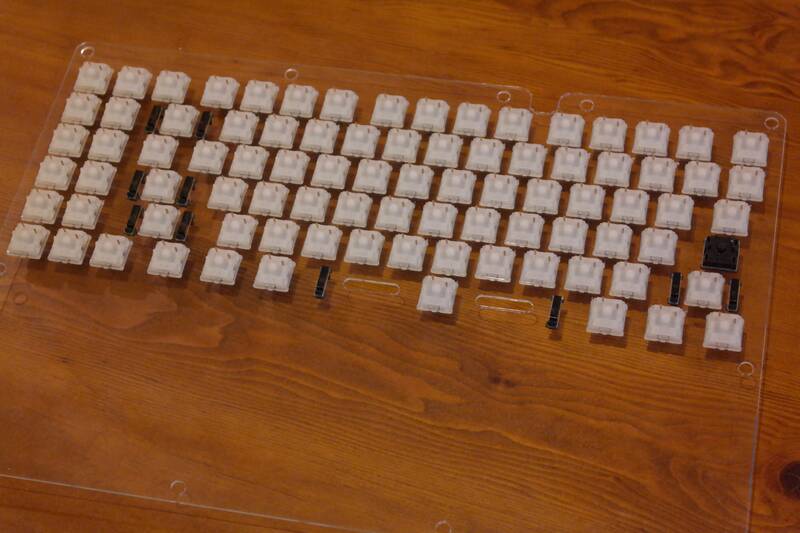 Also, this is going to be a fairly weak acrylic plate so I left as much material as I could between the switches. In addition to weakness, proper fitment of Cherry plate mount stabilizers is very difficult in acrylic. Costar feels nice, anyway. I really wanted this to be thin and slick. To keep it from looking chunky, I decided that exposed screws would be verboten. Unfortunately, BigBlueSaw won't do countersunk holes on plastic, so I finally decided to use Chicago screws. They're on the thick side, but they have very little protruding material. They also avoid the need for any kind of embedded nut or standoff, so that would hopefully be more attractive. I don't like a steep incline, so I didn't need much of an acrylic riser layer. Just small bumpons in the front and large Bumpons in the back. 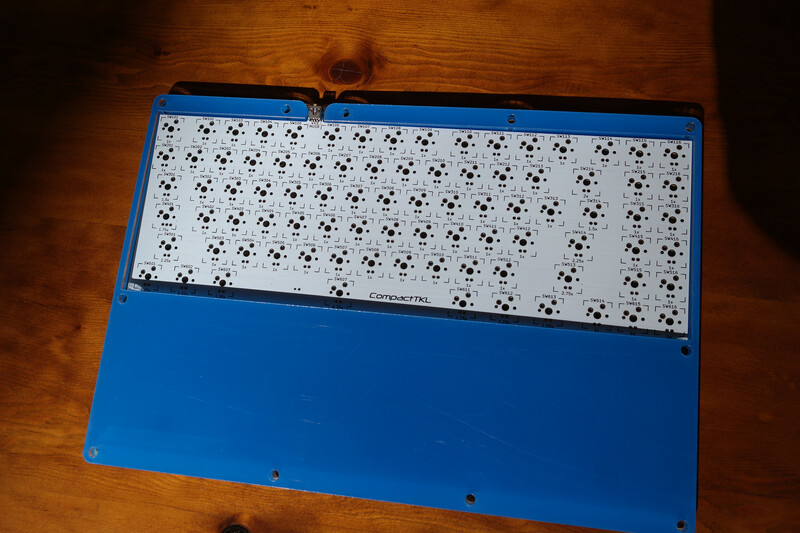 To keep the board low, the front Bumpons are inset into the first layer. I just hope that the completed case will be stiff enough as designed. BigBlueSaw did the laser cutting. He's the cheapest and the quality is decent. The parts arrive with their protective coatings still on, although they have obvious scratches that made it through. The parts are all clear acrylic underneath. The fitment is pretty close but it isn't going to be perfect. For one thing, the parts aren't perfectly flat. Still, I can't wait to build it! I actually had to place a second order for a final piece, but I'm waiting for switches anyway so it shouldn't slow me down. I spent a few bucks and the packages started rolling in. The first time I solder up a PCB is always a little nerve-wracking. I install the minimum for USB connectivity to make sure that if I do screw up, I don't waste too many parts. In this case, I could breathe a sigh of relief because everything worked perfectly. I settled in with my fine-tip Weller and tweezers, and spent a few hours cursing 0603 SMD. Behold my ugly but functional soldering job! 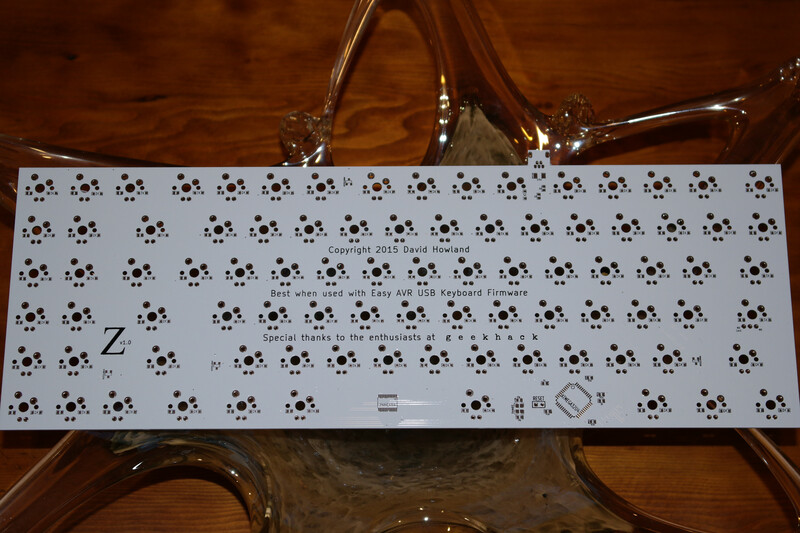 Next it is time to mate the plate to the PCB by installing switches and stabilizers. Unfortunately, at this point I ran into some trouble. The plate was manufactured incorrectly and all the cutouts were too small. The plate was destroyed. I reordered the same design from a different supplier and a week later I had something I could use. 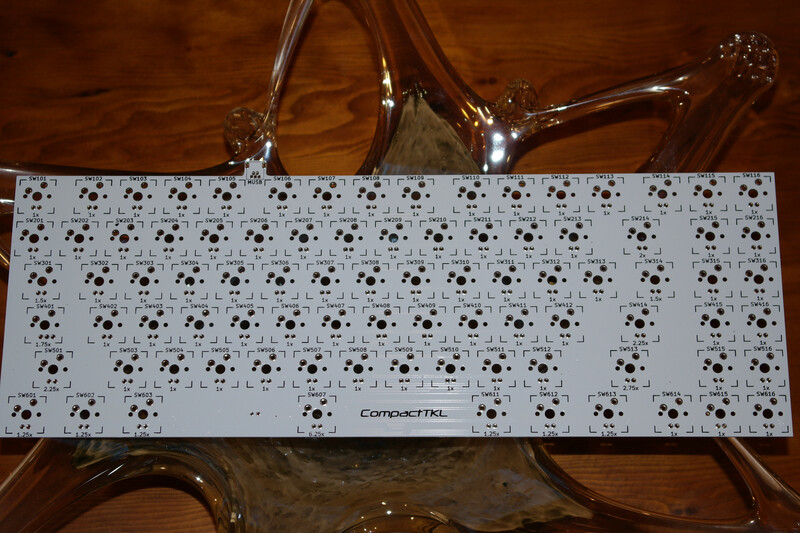 I mounted my new Gateron MX Brown switches with the Costar stabilizers. 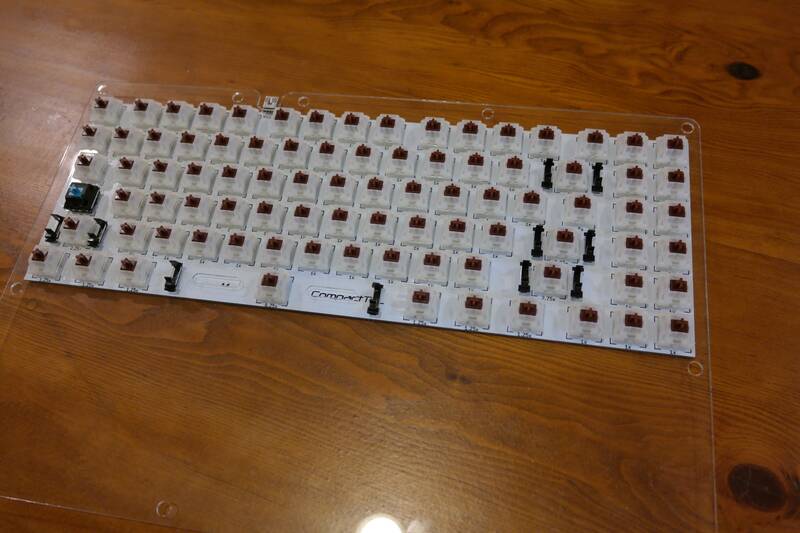 The whitish switches should go nicely with the white solder mask. The caps lock is using a MX Blue switch instead. I want to eventually mount an MX Lock switch there, but I don't have one. For now, the different sound of the clicky switch should help give me a notice when I hit caps by accident. I'm planning on using a Dolch set with this board, and my original vision included violet LEDs. However, to my dismay they were much too dim to use as backlighting. 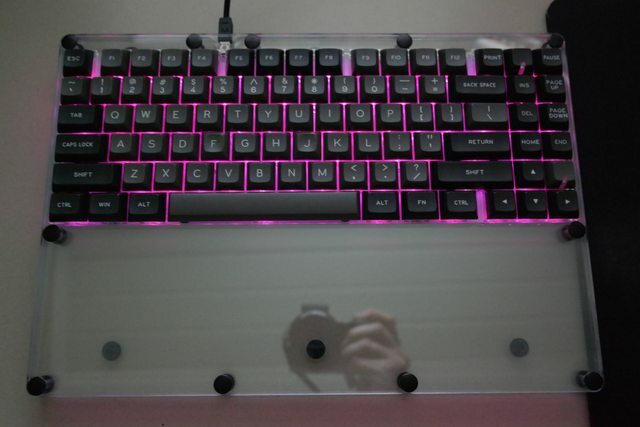 Therefore, I switched to brighter pink LEDs. 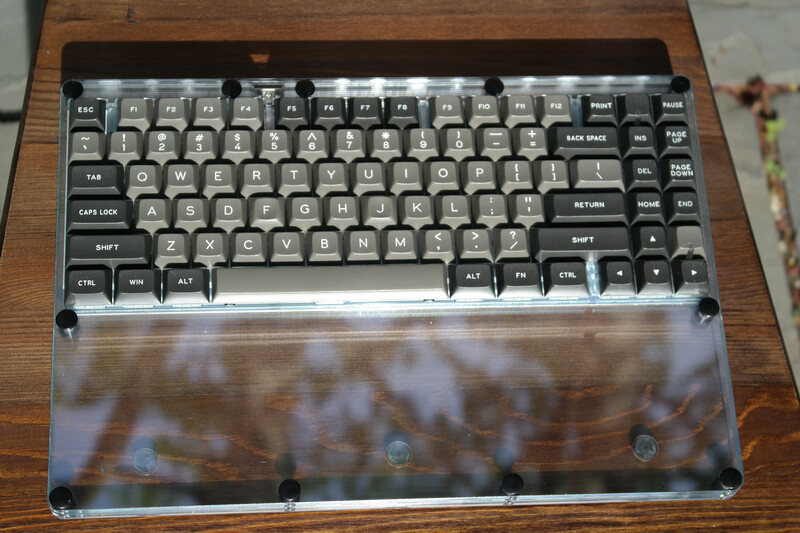 It still goes nicely with the Dolch color scheme and they look purplish when they are dim. After programming the firmware and checking that all the switches worked, I soldered in the LEDs. 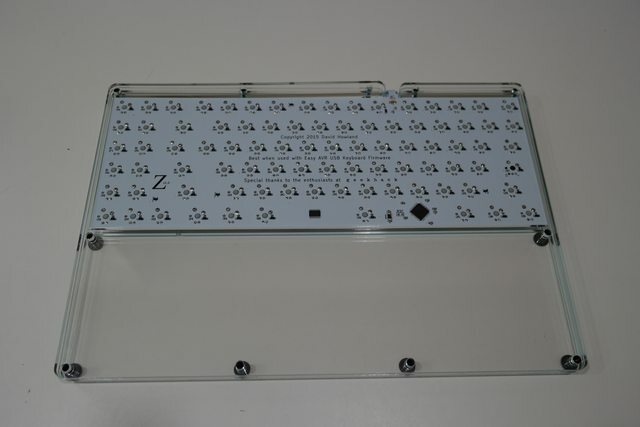 That completes the soldering work, so I began assembling the layers of the case. Clear acrylic is great for showing off the guts of the keyboard, but it is impossible to keep clean. A few imperfections ended up in between, but for an experimental project like this, you just can't expect perfection. Then all the case needed was some nice rubber bumpons to get a good grip on the table. Finally, it's ready for some keycaps and I can start getting acquainted with my new daily driver . Here's a few pics of the final product. I really love the way it looks. It's incredible. As much as I am digging the crystal clear case, I think it would actually look better with a metal case. I am going to have to make one of those one of these days. LEDs interfere with Costar stabilizers. How did I not know this? I used the rectangular LEDs, so it's not that bad, but the stabilized keys feel mushy. I'm going to try and modify the LED to make room for the stabilizer bar so they don't touch. 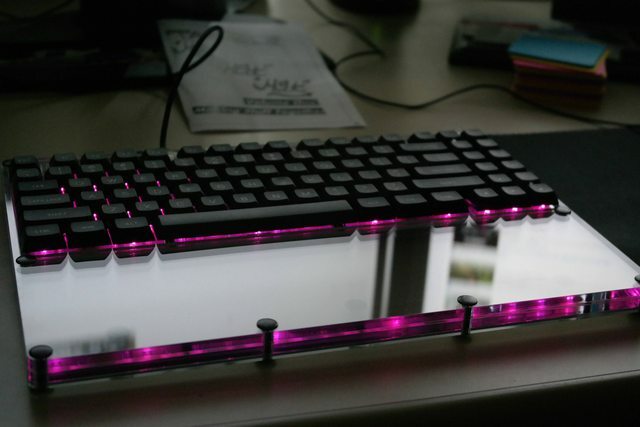 The built-in wrist rest works, but the acrylic corner is too sharp. I'm going to need to add some felt or foam to make this more comfortable. The layout is pretty good, but it does take some getting used to. It has the same problem as a 75%, which is that a sloppy typist will accidentally hit nav cluster while reaching for Backspace or Enter. I'm a sloppy typist, so I'm struggling with it a bit. I haven't trained myself to use the new location for Home and End yet. I think that will take several weeks of programming to get it into my muscle memory. I dig your thoughts on this aand can't wait to see more!!! One of things I don't like about the 75% layout is that the function row is bunched up on the number row without staggering. I like that you used a proper function row in your design, as it makes it easier to use without having to look at the keyboard. I also don't care for the compromises that have to be made to fit the nav cluster keys into the 75% layout. Your design addresses both my complaints with a minimal increase in size. 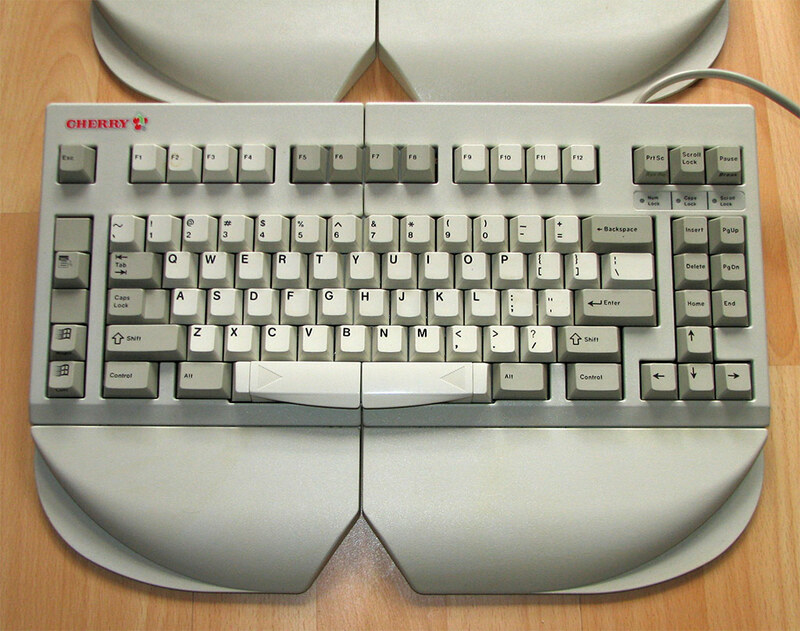 A gain of 1.5 keys' space over an 80% board doesn't sound like a lot, but having transitioned from a full-size keyboard, to an 80% keyboard, and now to a 75% keyboard, I can say that every centimeter counts when it comes to bringing the mouse closer to the center of my body. I appreciate your brutal honesty with regards to the pause/break key. And while I really like the menu key, it's kind of like fancy backlighting modes; it's interesting when you first discover it and experiment with it, then it quickly falls into disuse. Can I ask a semi-related question? You and derezzed both consider pause/break useless but it's a key I use at least weekly to pause Excel macros at work. Scroll lock on the other hand I never use at work, and at home I use Linux so it does nothing and the LED doesn't even light up to illuminate an artisan! What's it good for? I had no idea pause had any function in Windows. Figures it would be Excel. That is also the only real use of scroll lock. It causes the arrow keys to move the view in Excel instead if the cursor. Curious to know why there are gaps in the function row and between the right CTRL and arrow cluster. Why not compress it all? In short, because I like it. No other explanation is needed . Looking forward to the rest of this build log . I agree to Captain. Those gaps are ugly. At first you state gaps are wasted space (and ugly). Agreed. And then you create ... gaps! The gaps that I pointed out in the ANSI picture can hold a total of six 1x keys. The gaps in my final design are only 0.25x each. Also, I rather like the slight spacing. It's definitely not for everyone, no doubt. That's not my goal. I encourage you to design and build your vision for yourself. 6.25, because finding 6x is hard and I wanted common kits to work. My eyes are terrible, so I couldn't tell by looking.. that is great news tho! Are you planning on doing this as a one off, or a small group buy to reduce costs per unit a bit? I really like the design, specially because as a touch typist it is easy to move from a standard ANSI to this. The only thing I would change is perhaps add 0.25 space between the function row and the rest of the board. That's a good idea, actually. Extra space up there doesn't affect my mouse placement at all. I guess I just was on a compression kick when I designed this. I highly recommend either putting a 1/2u gap between number and function row, or else leaving no gap or a 1/4u gap, but only with a keycap profile including extra-tall keycaps for the top row (e.g. Cherry profile row A, or DCS profile row 5). Haha. I really like the 1800 layout, but two things I don't like is the large 1u gap between the function row and the number row; secondly, how the delete key is shifted two units up (Which you have addressed). I then experimented with having no space between function row and number row on a prototype plate, didn't really like it, so yeah, a little space is good I think, specially since it is a vertical increase and thus not changing position of mouse as you said yourself. Having no space doesn't really bother me, to be honest. Im strange, in that I realky like how the 60% boards look, i just dont like to use them. So my compact designs try to get really small. The Noppoo Nano 75s has what looks like a .25u gap between the number row and function row and it looks pretty good -- noticeably distinct from the number row without being remote. You will probably want to try drag soldering that controller. Looks nice though! Who manufactured it? I like where this is going. The suspense! Where is part 3 and 4?? I'm not a big fan of drag soldering. I already did it the old fashioned way. Nice PCB! And very nice routing. When I picked up a cheap ($60) hot air rework station and did my first SMD parts with paste and hot air, I was kicking myself for not doing it sooner... you don't need to use (and clean up) all the flux you need when using an iron for SMD. It also rocks for desoldering parts. Do you already have a case design in mind? I destroyed one of my Epsilon boards by using the hot air to solder the microcontroller. Cooked the chip, wouldn't work, lifted the pads and traces trying to desolder it. I find that doing it with a nice Weller tip is faster and more reliable. That pcb looks great! I have to finish up my first board, which I am hand wiring, bit next will need to be a full pcb. Is there any chance you would post the pcb files? If not I understand. I love these project logs, following with interest. I love this layout! if it ever comes to be I would be interested in getting one. I have several PMs asking similar things. Let's just see how the finished product turns out first. To be honest, I think most people would be shocked at how much it costs for a low-production-run custom, not to mention the amount of time and energy. I think this is a useful improvement to the 75% layout (my favourite). I'd happily buy a PCB. 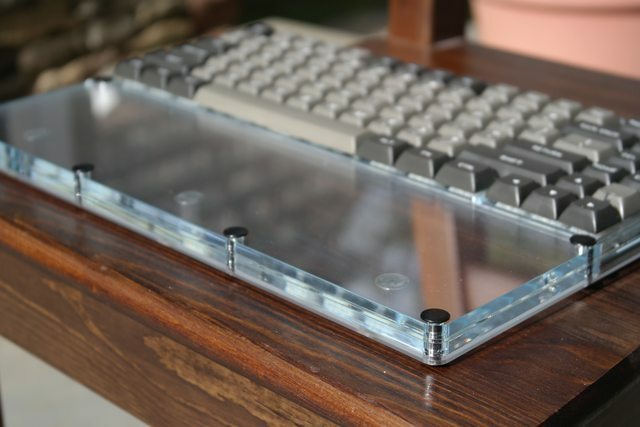 Great design of the case! Can you share details on the "binding post" and how that works? For my own "sandwich" case, I was going to use countersunk screws and just manually drill out the countersink from lasercut acrylic or wood, but I'm keen to see other options. You're making rapid progress, keep up the good work! 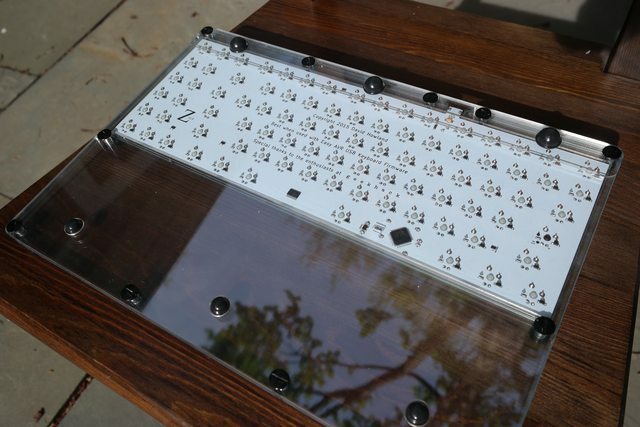 Is he making rapid progress...or did he already finish the board and he's just posting the build log in parts? Yeah I would never attempt to drill acrylic without a drill press, which I don't have. I know I'd screw it up. I updated the OP to be more specific. Google search "chicago screws", you'll see what I mean. However, the firmware definitely works. Love the layout man! Can't wait to see the finished product. Me too. I'm more tooled up for electronics than crafty stuff. Thanks for that McMaster-Carr link! The quality of that part was honestly not good enough, IMHO. The anodization was chipped off on 100% of the parts. I used a black Sharpie to fill it in. My next case will definitely be aluminum, now that I know everything fits. I want those countersunk screws. Epic fail! I scheduled tomorrow for the great unveiling, but the dream has died. 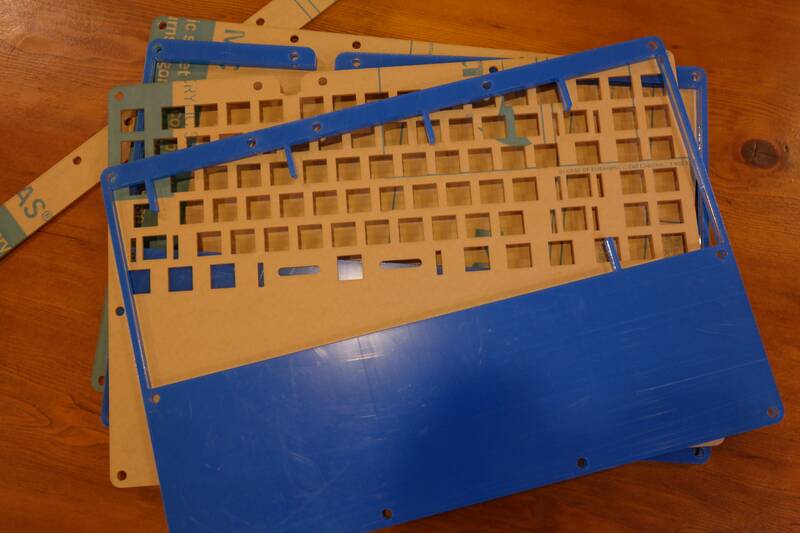 The parts from bigbluesaw don't match my design well enough and every single cutout was too small. Attempting to fill the plate with switches destroyed it. I just don't know how I'm going to finish this project. Yeah, but they require Illustrator/Inkscape. Who on earth does CAD in Inkscape? Insane. My drawings are all DXF. Page created in 0.108 seconds with 77 queries.